And the average local authority secondary school debt is ??483,000. Former Education Minister David Laws, who chairs the Education Policy Institute (EPI), said the latest school budget figures, for 2017-18, showed a "marked deterioration". Head teachers' leader Geoff Barton said the study showed funding levels were "unsustainable" and many schools were now facing a "financial cliff edge". Mr Barton, leader of the ASCL head teachers' union, warned that without adequate funding for schools, "educational standards will deteriorate". Mr Laws said the government should prioritise supporting schools facing such "excessive" funding difficulties. And while there are rising numbers of schools struggling with budget problems, there are also many with surpluses, worth in total about ? ?1.8bn and including ? ?250m not earmarked for any expenditure. But the National Education Union says that funding is not keeping pace with rising cost pressures - and that since 2015 the school system has 326,000 more pupils. West Sussex head teacher Jules White, the group's leader, said there were widespread concerns over school funding shortages among the 7,000 head teachers supporting the campaign. They have complained of having to ask parents for contributions and have cast doubt on what the government says about school budgets. Mr White accused the Department for Education and the Treasury of "hiding behind slogans" while schools were "sliding into greater and greater debt". He said that even though schools were reporting worsening finances they were "being asked to prop up all manner of other social care and support services". "The notion that head teachers are sitting on pile of cash whilst making awful cuts to their school service and to teacher numbers is fanciful," said the school funding campaigner. Labour's shadow education secretary, Angela Rayner, said the "number of schools in deficit is skyrocketing" but the government was "refusing to accept that this is creating a crisis". "The report itself shows 94% of academy trusts and almost 90% of local authority maintained schools are reporting a cumulative surplus or breaking even - and, 45% of maintained schools have even been able to increase the level of their cumulative surplus in 2017-18," a Department for Education spokesman said. "While the core schools and high-needs budget is rising from almost ? ?41bn in 2017-18 to ? ?43.5bn by 2019-20, we do recognise the budgeting challenges schools face. 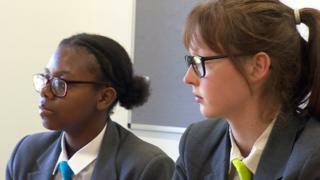 "That is why the education secretary has set out his determination to work with the sector to help schools reduce the ? ?10bn they spend on non-staffing costs and ensure every pound is spent as effectively as possible to give children a great education."